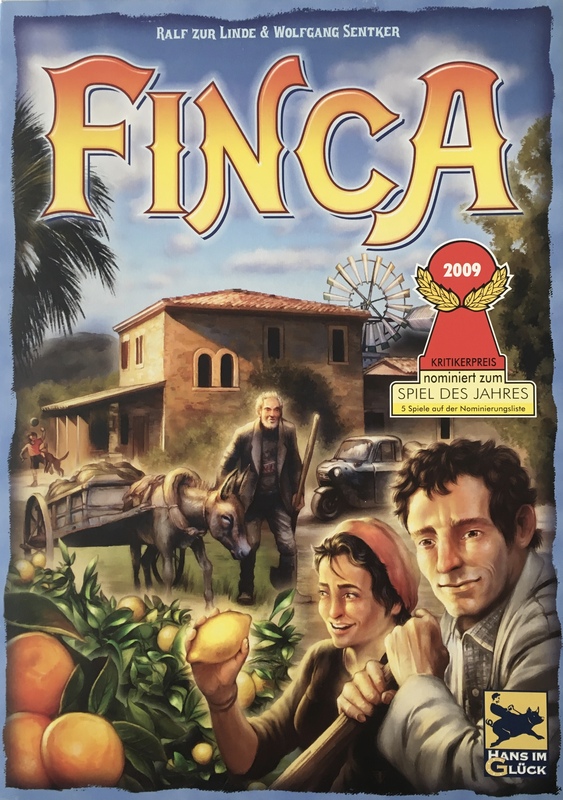 With the long awaited re-release of Finca nearing the end of a successful run on Kickstarter, I thought it the perfect time for a review of this sought after game from 2009. Finca, designed by Ralf zur Linde and Wolfgang Sentkler, was named after the rural farming estates on the Mediterranean island of Majorca. Although a lot of fincas have now become holiday cottage destinations, the game centres on the crop production and delivery aspects of the traditional fincas. Players take on the role of farmers harvesting fruits and then delivering them to the communities whose demands for particular fruit types and combinations are always changing. 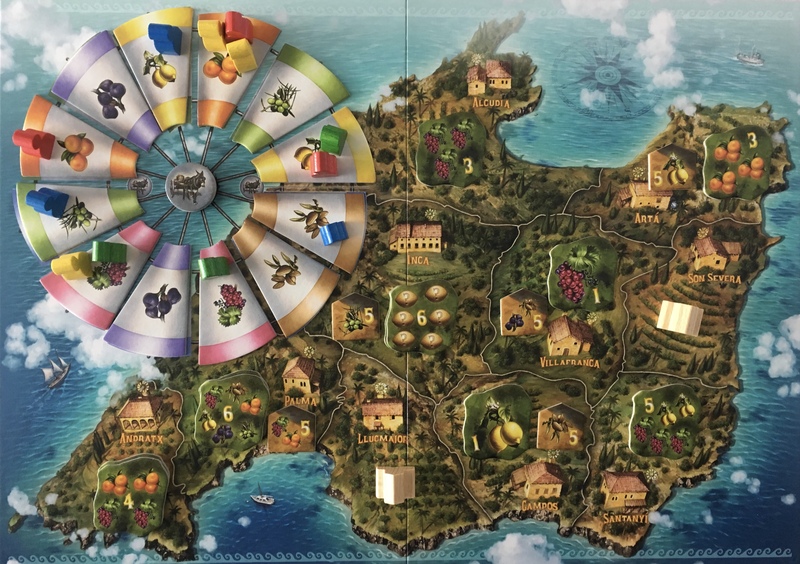 The game board shows a map of Majorca split into 10 farming estates which at the start of the game are each loaded with a stack of 4 Fruit Tiles face down. The remaining 2 Fruit Tiles are placed back in the game box. The top Fruit Tile in each stack is now turned face up. Each fruit Tile shows a number, ranging from 1 to 6, of fruits required in order to collect that particular Fruit Tile. The fruits can be figs, olives, almonds, oranges, grapes or lemons or a combination of them. Some of the Fruit Tiles do not show a particular fruit type and require a number of one specific fruit of the player’s choosing to collect that tile. The total number of fruits on each tile is the number of victory points the player will receive from collecting the tile. The Finca Tiles which show 1 or 2 fruit types are shuffled and one placed face up in each of the farming estates. These tiles are used to generate bonus victory points during the game. In one corner of the board is a 12 bladed windmill upon which 12 Windmill Blades are placed during set up. The blades show one of the fruit types and these are shuffled and randomly placed on the windmill. A number of circular donkey cart tokens equal to twice the number of players are placed on the centre of the windmill. Finca is a well produced game and one of the best components are the wooden “vegemeeples” representing the fruit. The game contains a total of 108 of these wooden fruits, 18 of each fruit type, and these are placed as a supply next to the game board. The 4 Bonus Tiles which show numbers 1 to 6 are placed face up in descending victory point value (7 through to 4) next to the game board. A player may earn one of these Bonus Tiles during the game when they have collected a Fruit Tile of every value from 1 through to 6. 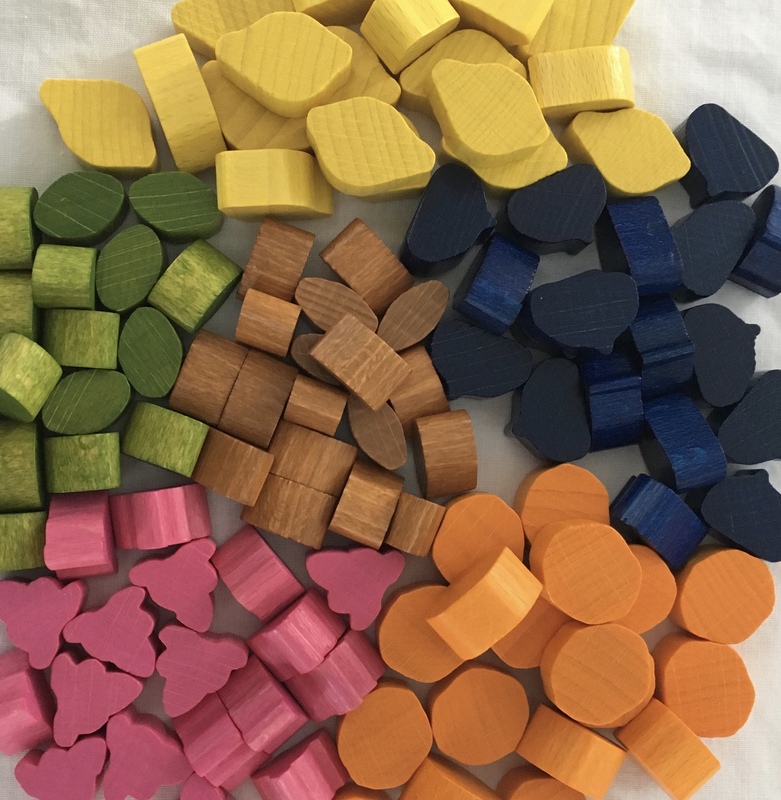 A number of wooden farmhouse Finca pieces equal to the number of players plus 2, are placed as a supply. These Fincas will be placed during the game and the game will end when the last one is placed on the game board. Each player takes a number, depending upon the number of players (3 in a 4 player game), of wooden Farmers in their chosen colour together with 4 Action tiles. These Action tiles provide a single use action during the game which I will explain later in this review. Before the first round of the game, the starting player places one of his Farmers on a Windmill Blade and takes one fruit of the type shown on the Windmill Blade. Players follow in a clockwise direction until all Farmers have been placed. Now the game is ready to being with the starting player and then continuing clockwise. A Farmer is moved (clockwise around the Windmill Blades) a number of blades equal to the number of Farmers on the Windmill Blade on which it started its movement. The player then collects as many Fruits of the type depicted on the Windmill Blade on which the Farmer ended its movement as there are Farmers present on that Windmill Blade. The collected Fruits are placed in front of the player in the player area. If there are insufficient Fruits in the supply then all players must return all of their Fruits of the required type and then the active player collects their Fruit. This movement and collection provides interesting depth to the game as players need to think about how to maximise their Fruit collection and minimise that of their opponents. This is one of the aspects of the game that really appeals to me and takes what appears to be a fluffy simple mechanic to a new level. On opposite sides of the Windmill there are two Donkey Cart icons and if the Farmer crosses over one of these icons during its movement then the player collects a Donkey Cart from the centre of the Windmill. The same rule applies if the supply is empty where all players return all of their Donkey Carts and then the active player collects one. A player delivers fruit to one or more of the estate communities on the game board. A Donkey Cart is required to transport a maximum of 6 Fruit to the estates and the player takes the chosen Fruit Tiles from the game board, returning the specified Fruits to the supply. In this way a full Donkey Cart could satisfy the demands of a single 6 Fruit Tile or three Fruit Tiles valued 1, 2 and 3 etc. With open information, players can see which Fruits are being collected by their opponents and careful planning is needed to ensure that they secure their target Fruit Tiles before another player collects them. However this may not be as simple as it first appears as players need to avoid under utilising their Donkey Carts just to quickly grab a Fruit Tile. When a player has collected a set of 6 Fruit Tiles, one of each value 1 through to 6, then as a bonus they take the top Bonus Tile. When the last Fruit Tile is taken from an estate then a Finca is placed on that estate and the Finca Tile from that estate is awarded. The Finca Tile shows 1 or 2 fruit types and the player who has the most of these fruit types on his collected Fruit Tiles wins the Finca Tile. For example if the Finca tile shows grapes and figs then the player who has the most grapes and figs icons on their collected Fruit Tiles will win the Finca Tile. All Finca Tiles are worth 5 victory points. Double Windmill Move – carry out the normal Move Farmer and Harvest Fruit action. Then carry out a second Move Farmer and Harvest Fruit action with either the same or a different Farmer. Gust of Wind – move a Farmer to any Windmill Blade and collect Fruit in the normal way. Donkey Carts are not collected with this Action Tile. Large Donkey Cart – Deliver upto 10 fruit using this Action tile instead of a normal Donkey Cart. One Less Fruit – Deliver Fruit but collect one Fruit Tile (value 2 or more) by handing in 1 less Fruit. Using this tile is is possible to take Fruit Tiles upto a value of 7 with only 6 Fruit and a Donkey Cart. Each unused Action Tile is worth 2 victory points. The player with the most victory points is the winner with ties being broken by the most collected Fruits in their player area. Finca is a game that has got regular plays both with my family and gaming group since I bought it 9 years ago! That fact in itself is remarkable, especially due to the increasing number of games being released each year. So there must be something about this game that explains its staying power. Firstly, despite the board being small (A3 size), it looks inviting when it is set up: the colours are vibrant and the pile of wooden fruit enticing. The choice of a single, simple action each turn makes the game progress swiftly whilst the decisions about movement and the need to keep an eye on the other players provides sufficient depth to keep even hardened gamers interested. It is the simplicity of the whole game and how well the mechanics smoothly mesh together that show Finca to be a well tested and designed game. 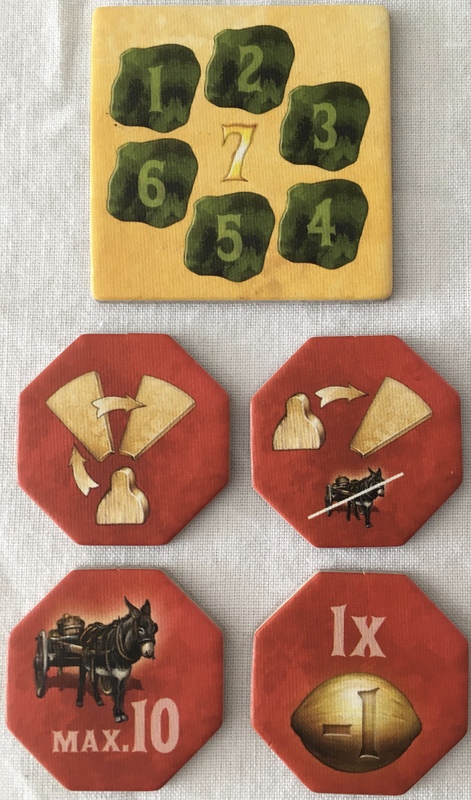 The Action Tiles to get you out of a difficult situation, albeit at the cost of victory points, in a game that takes less than a hour to play appeals to me. I tend towards the “cult of the new” and look forward to new and different games being released, but every time Finca hits the table it still feels fresh and I have not come across a game that will replace it in my collection. Since Finca went out of print it has become sought after with copies selling for inflated prices. Hopefully this Kickstarter campaign will give the chance for gamers seeking out this little gem to add it to their collections. Jonathan F.: I really enjoy Finca, especially the rondel and the planning ahead. My only issue, which I have in common with Cinque Terre, Merkator, and many other ‘contract’ games is that the right contract flipping at the right time can decide the game. The bits and art are so great that I would almost always say yes to a game of Finca. 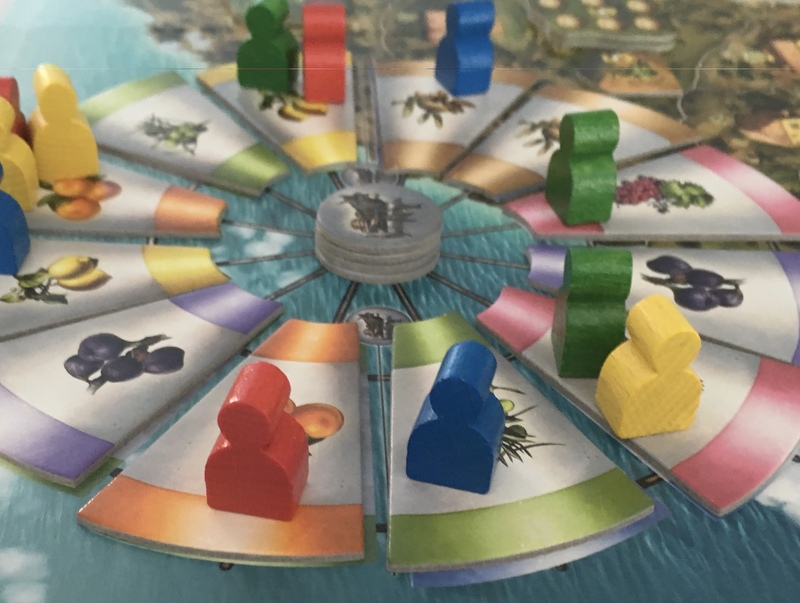 Mark Jackson: I played Finca 3 times the year it came out – and while many gamers (like Simon) found it compelling, it never went beyond “yeah, if that’s what everyone else wants to play” for me. I agree that the game is attractive and the game design solid. However, there are other “figure out the puzzle to score points” games that I find much more interesting- most recently, Azul or Majesty for the Realm. I love it! Simon N.
I like it. Jonathan F., Eric M.
This entry was posted in Reviews and tagged board games, Finca, Hans im Glück, Ralf Zur Linde, Wolfgang Sentker. Bookmark the permalink.